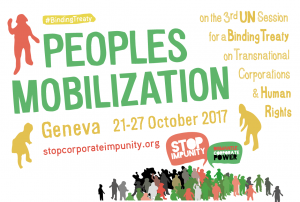 Social organisations and movements, communities affected by the operations of transnational corporations and others fighting for social and environmental justice around the world, will march to Geneva in October 2017 (23rd to 26th). This will be the third time we mobilize for the establishment of a United Nations (UN) treaty that imposes on states and corporations international obligations to guarantee the access of the affected communities, groups and individuals whose human rights have been violated by transnational corporations to justice. Read the call to action here. We are bringing attention to this issue with a twitter storm that exposes what are the actors that constitute the Architecture of Impunity, and more importantly, that we are organized against them and therefore that “The end of corporate impunity is coming”.